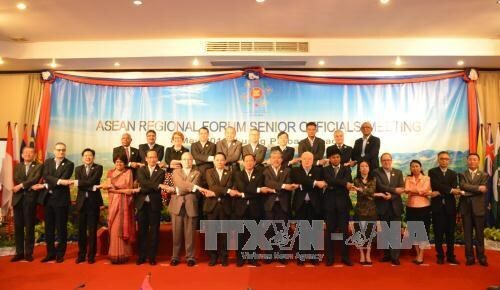 Vientiane (VNA) – A statement on enhancing cooperation among law enforcement agencies at sea proposed by Vietnam was adopted at the 23 rd ASEAN Regional Forum (ARF) in Vientiane, Laos, on July 26. A Vietnamese delegation led by Deputy Prime Minister and Foreign Minister Pham Binh Minh attended the forum as part of the 49 th ASEAN Foreign Ministers’ Meeting (AMM 49). Ministers highlighted the significance of the ARF as a dialogue forum on political and security matters of shared concern and interest in Asia-Pacific, which aims to build trust and cooperation for peace and stability in the region. They acknowledged the outcomes in realising the plan of action to implement the ARF Vision Statement to improve the efficiency of addressing more complicated challenges in the region. Foreign ministers reviewed the enactment of measures to build trust and preventive diplomatic measures in 2015-2016. They hailed the Inter-Sessional Support Group on disaster relief, the prevention of terrorism and cross-border crime, the maintenance of navigational security, and the non-proliferation and disarmament of nuclear weapons. The forum adopted a list of activities for the next mid-term year 2016-2017. Accordingly, Vietnam along with Australia and the European Union will co-chair the ARF Inter-Sessional Support Group on navigational security in the 2017-2020 tenure.